An exhibition of sculpture by El Anatsui is scheduled for June 12 through October 16, 2011 at the Stone Hill Center of the Clark Art Institute in Williamstown. It will run concurrent with Pissarro’s People in the Clark’s main building, expected to be one of top attractions in the Berkshires this year. Also on display will be an exhibition of contemporary photograhs by Candida Höfer and Thomas Struth. El Anatsui will present three of the artist’s compelling sculptures within the two galleries of Stone Hill Center. 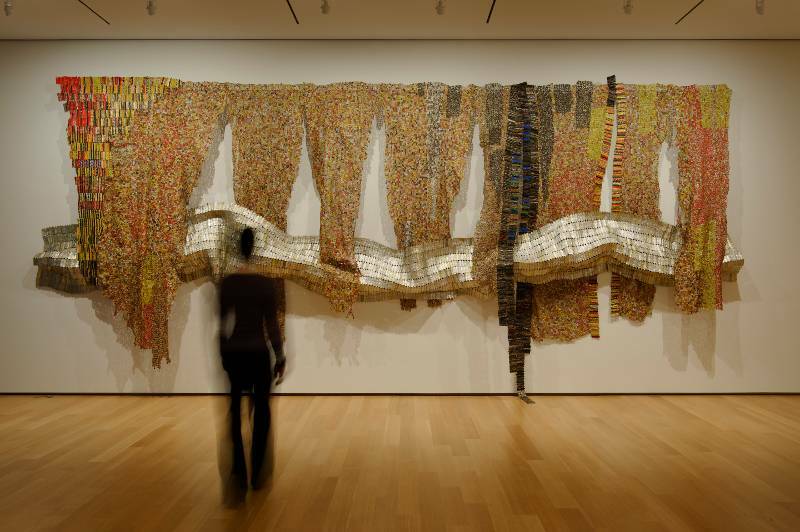 Hand wrought of found aluminum wrappers from liquor bottles, Anatsui’s sculptures arduously marry textile design and patterning from Nigeria and Ghana with modernist grid-based abstraction. The opulent beauty of these works provides a fascinating counterpoint to the questions they raise about waste, consumerism, and the legacy of colonialism. Two of the works that will be installed at the Clark, Intermittent Signals (2009), a dramatic piece measuring 11 x 35 feet and Strips of Earth’s Skin (2008), measuring 10 x 22 feet, are on loan from the Broad Art Foundation, Santa Monica, California. The third work, Delta (2010), a new work measuring 11 x 11 feet, will make its museum debut at the Clark and is on loan from a private collection. Although they had been widely exhibited for more than 30 years, El Anatsui’s works came to the attention of global audiences with their inclusion in Africa Remix, a landmark exhibition presented internationally from 2004 to 2007. Born in Ghana and living in Nigeria, his participation in major exhibitions such as the 2007 Venice Biennale and Who Knows Tomorrow at Berlin’s Nationalgalerie in 2010 established Anatsui as one of the most significant artistic innovators of our time. Until June 26, Anatsui’s work can also be seen at the Davis Museum at Wellesley College in an exhibition that will later travel to the Museum for African Art in New York as part of a major national tour. The works will be shown in the Tadao Ando-designed Stone Hill Center in two intimate, naturally lit galleries offering landscape views. A publication will be produced in conjunction with the installation, which will include an essay by Alisa LaGamma, Curator in the Department of the Arts of Africa, Oceania, and the Americas at the Metropolitan Museum of Art, and an interview with El Anatsui conducted by former Clark fellow Chika Okeke-Agulu, Assistant Professor in the Art and Archaeology Department at Princeton University. David Breslin is guest curator of the installation. The Clark also is pleased to offer a range of special programming to complement the work of El Anatsui. 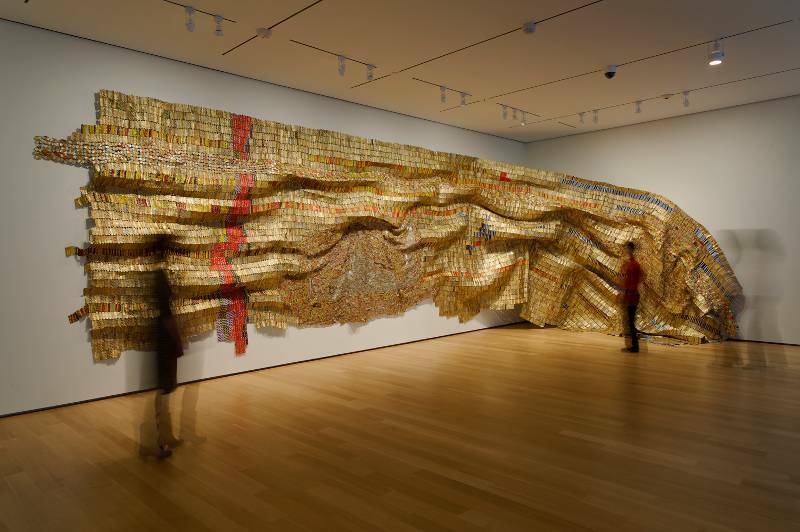 On July 24 renowned curator and filmmaker Susan Vogel will screen her documentary entitled Fold Crumple Crush: The Art of El Anatsui and deliver a talk about the making of the film, which follows the artist for three years and gives an insider’s view of the artist’s practice and techniques. Additionally, a Ghanaian storyteller will present weekly tales on the picaresque balcony of Stone Hill Center. See also: cultural events in the Berkshires during June 2011.